I love to listen to different versions, so I have listened to a fair amount of different approaches to the opera, including in this case the one by Deller himself with Britten conducting. Coachings are key, I have worked on the music on my own but having someone to coach you in terms of diction and elements of the music that you may not be entirely aware you need to focus on are essential. Definitely what attracts me to NUOVA is the fantastic faculty they bring. I have also only heard wonderful things about the program from colleagues that have done it before. I have decided to participate this year in particular because I want to undertake the challenges of this role which I have intentionally avoided for a while because it utilizes a part of my voice I am currently working to develop. By taking the role on I am not only challenging myself but also excited to be able to coach it with people who will be able to help me improve my approach to it. Education: BMus in Vocal Performance, University of Lethbridge; MMus in Literature and Performance, University of Western Ontario; Advanced Certificate in Performance, University of Toronto; DMA in Vocal Performance (2022), University of Toronto. 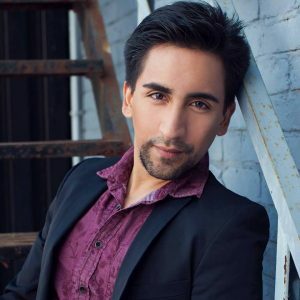 Experience/Roles: Active recitalist with Kuyum Ensemble, Soloist for Handel’s Messiah and Bach’s Magnificat (Lethbridge Symphony Orchestra), soloist with Mexico Marine Symphony Orchestra, young Tepozteco in del Toro’s “La Leyenda del Tepozteco” (Mexico Youth Symphony), Sheppard in Ravel’s “L’Enfant et les Sortilèges” and Witch in “Hansel and Gretel” (University of Western Opera), Tonio in Donizzetti’s “La Fille du Regiment” (London Community Players and Fountainhead TheatreWorks), Monostatos in Mozart’s “Magic Flute”(Toronto City Opera). Upcoming Engagement(s): Private Recitals (Toronto, ON), Académie de Fourvière (Lyon, France), SienAgosto 2019 (Siena, Italy).